The assessment of global plastic wound retractors market for the year 2017-2025 shows that the market is expected to witness sluggish growth in the coming years. This growth is expected to be mostly driven by increasing adoption of disposable plastic retractors for various surgeries such as hernia, C-section, bariatric surgery etc. Whereas the only factors that are hindering the growth of market are lack of skilled laparoscopic surgeons and side effects associated with the surgery and availability of alternative retraction systems. 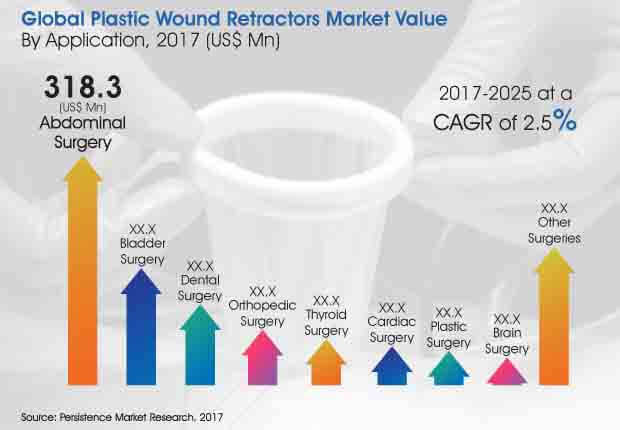 With the aforementioned aspects affecting the market growth of global plastic wound retractors market, the analysis reports show that this market is expected to grow at a CAGR of 2.5% over the forecast period reaching a revenue of over US$ 550 Mn by the end of 2025. The major contributor for the growth of global plastic wound retractors market is the increase in the rate of surgeries worldwide. The plastic wound retractors experience high demand for bariatric surgery with increasing number of obesity treatments. According to World Obesity Federation, obesity rate is predominantly higher in developed regions than in developing regions. This has led to increase in demand for bariatric surgery. Another surgery, which has increased the demand for global plastic wound retractors are C-section surgery for child birth. Cesarean section (C-section) is the most common surgery performed on women of reproductive age across the globe. According to the American Medical Association, the rate of C-section is 19% among all pregnancies across the globe. About one in three births in the U.S. happen by C-section, and the rate of C-section has dramatically grown over the past few decades. The analysis of global plastic wound retractors market is bifurcated into various segments on the basis of product type, application, surgery type, end user and region. The segmentation done on the basis of application includes those surgeries that find the most common application for the use of plastic wound retractors. This comprehensive research report indicates that the segment of abdominal surgery leads among all other surgeries under the application segmentation. Abdominal surgery is likely to witness an exceptional revenue share in the market, with an estimated valuation of over US$ 385 Mn by the end of the forecast period. Among the sub segments of abdominal surgery, hernia sub segment tops with a revenue of a little under US$ 90 Mn by 2025 end. The bladder surgery segment is the second largest in terms of market value and is estimated to reach over US$ 35 Mn by the end of 2025. Plastic wound retractors find increasing application in abdominal surgeries in the North America plastic wound retractors market. The abdominal surgery segment is expected to witness a significant market revenue of over US$ 90 Mn by the end of forecast period. Whereas the bladder surgery segment shows a revenue share of just over US$ 9 Mn by 2025 end. In the Asia Pacific regional market, the abdominal surgery segment is estimated to reach a market valuation of a little under US$ 130 Mn by the end of the assessment year, followed by the bladder surgery segment that reflects a market estimation of about US$ 11 Mn towards the close of the period of forecast.